Massive week for members with a plethora of events to cover! The week started on Bank Holiday Monday with the Shinfield 10k. Great runs from everybody and all members finished under an hour on a very hot morning. Collette Callanan continued her great run of form finishing 1st in the W50 category. Leon Hicks completed his 101st marathon and his first since the 100th celebrations over a month ago (which is a big break from running 26.2 miles for Leon!). He traveled to Northampton to complete his friend and ‘Running Wife’ Zoe Cook’s 100th marathon. Also, on the marathon front Caroline Stuart looked to capitalise on her Manchester marathon fitness and toed the line for the Milton Keynes Marathon. Caroline managed a strong run on another very hot day to finish in 4:21:26. Thursday saw the super fun and sold out Windlesham Pairs Relay. The results have just been released and we’ve included the SJ teams along with a gallery of pictures from Royston Crandley which capture the spirit of the event. Also on Thursday evening it was the first race in Dinton Pastures 5/10k summer series and a number of members enjoyed a great evening. Susan Plumb was missed from the SJ listings and she finished the 10k strongly in 1:08:01. At parkrun the biggest member turnout was at Frimley Lodge with twelve SJs in action. Dave Metcalfe ran his second parkrun and posted a PB. Max Woods was first home for the club narrowly missing out on going sub-20 but still logged his fastest run since October 2016. Lisa hale was next in third and fastest run at Frimley Lodge this year. Over at Bracknell there was a brilliant run from Charlie St Aubyn in 11th position as he logged his fastest time on the new slower Bracknell course and his fastest since August 2016. Craig Waters bagged a PB for the Bracknell course. A PB at Rushmoor for Andrea Vincent as she beat 25 minutes for the first time while John King was first member to finish. Much of this week’s Parkrun Tourism was focused on the multitude of different venues within a 30 minute drive of Sandhurst. Robert Jerrett ran at Basingstoke, Kate Parker at TVP Reading, Jon Green at Woodley, George Green at Woking, Stuart Overhill at Mole Valley and John Tovell at Crane Park. While further afield Connor Vine has recovered from the London Marathon to run his fastest time at Bicester and Andy Summerskill was again in action at Houghton Hall. Kate Parker discovered a fun and reasonable local fun run at the Silchester races. Kate has already written about it and we’ll share that shortly. Richard Boese completed the The Ox 50 miler on Saturday but it came with a Friday night pre-ultra 10km to soften runners up. Richard has promised a full report once he’s recovered. Jonny Gubb made the long drove down to the South West for VO2 Event’s Devon Coastal Marathon. On the Day 1 marathon he led for most of the race eventually being passed late on but holding onto an impressive 2nd place on the demanding course. More Ultra action as Patrick Wadsworth was doing the three day Cotswolds 100. Just the final day to complete on Monday 14th May as he heads to Bath. The big local event this weekend was the Bracknell Half Marathon where we had lots of members. Great running from everyone on what is a deceptively tough course so kudos to Mark Neve and Blanche Barnes who both achieved personal bests. Fiona Slevin-Brown demonstrated she’s fully recovered from illness by finishing 2nd woman overall. The detailed SJ results are below although these missed Kate Turnell and Lucy Hale. Matt Johnson wins the dizziness award as he tackled the Eastbourne Trackstar Marathon with a mind blowing 105.5 laps of the track. Jane Bannister completed the Marlow 5. Jim Casey returned to one of his favourite events; The Woodland Woggle. Ten Milers are rare but Graham Bolton found a great event down at the Alton 10. 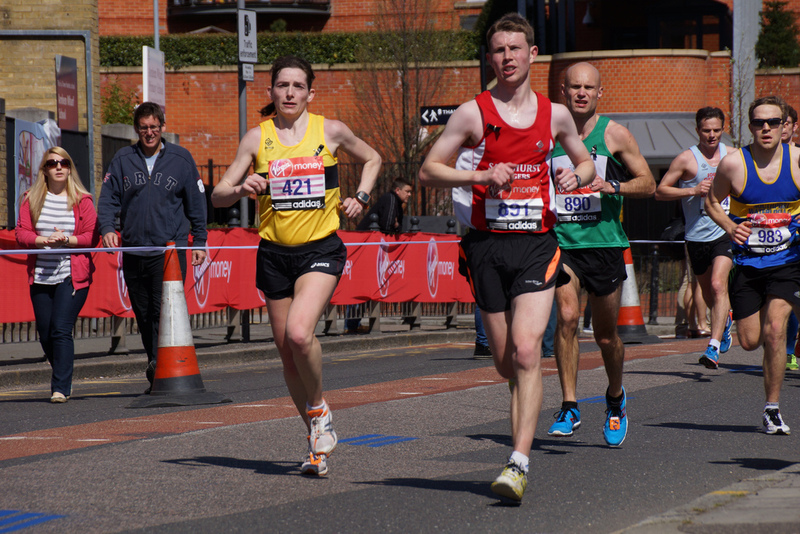 Lisa Hale and Stuart Overhill ran at the Staines 10k. Lisa finished 4th female and second in category running her fastest 10k for 11 years! Stuart also achieved a 10k PB. Monday: Paul Biggs will be leading the Monday night chatfest as Patrick is still returning from Day 3 of his Ultra. Meet at Sandhurst Sports Centre at 7:30pm. The route will cover approx. 6 miles and will either be on or of road depending on the ground conditions. This is one of the most sociable runs of the week and a great opportunity to catch up with friends or discuss the preceding weekend. And don’t forget the Monday Mantra ‘Mondays defo make me faster’. Thursday: This week the threshold/improvers run will be the monthly paced run. Final route is still TBC but will be off-road. This run is suitable for all abilities and as this run grows in popularity there are even more groups of varying speed to fit with your ability. There is also a shorter route and a sweeper to make sure nobody gets left behind. Meet at Sandhurst Sports Centre at 7:30pm. Saturday: Lots of members will be action at Parkrun at 9am on Saturday morning. Don’t forget your barcode! Its the Surrey Heath Show this Saturday at Frimley Lodge so Frimley Lodge Parkrun won’t be running. We have so many local options it will be a great chance for the FL regulars to try some local tourism.